VMware has announced the VMware vSphere 6.5 at the end of last year. 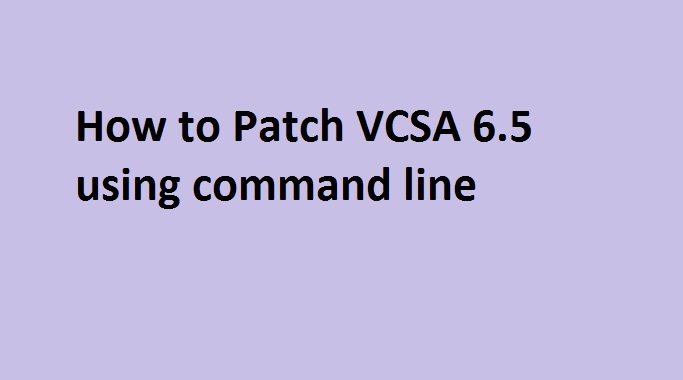 vSphere 6.5 includes some of new features & new improvements compared to current version of vSphere 6. vSphere 6.5 includes many of the security features such as ESXi secure boot, VM Encryption , vMotion Encryption, Virtual Machine secure boot. vSphere 6.5 also brings the all new & improved vCenter Appliance 6.5 for management of the vSphere objects. vSphere 6.5 also provides the high availability for the vCenter Server. 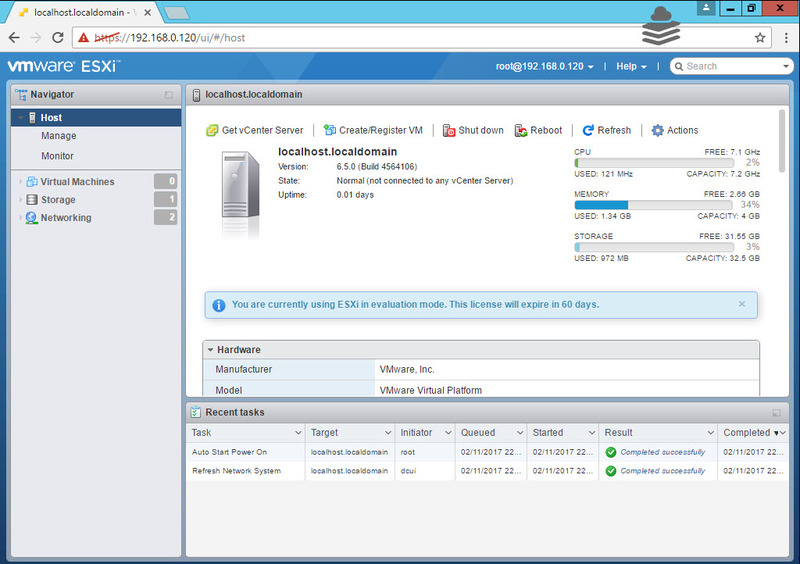 vSphere 6.5 comes with the 2 new web clients one for the ESXi 6.5 & one for the vCenter 6.5. In our previous posts we have seen on how to install & configure ESXi 6.5 so in this post we will see the newly announced ESXi web client. VMware has also launched the new simplified web client to manage the ESXi in the all new way using the browser. In this post we will see on how you can access & manage the ESXi 6.5 using web client. To access the ESXi 6.5 web client just put the IP address or hostname of the ESXi 6.5 in the browser with https. 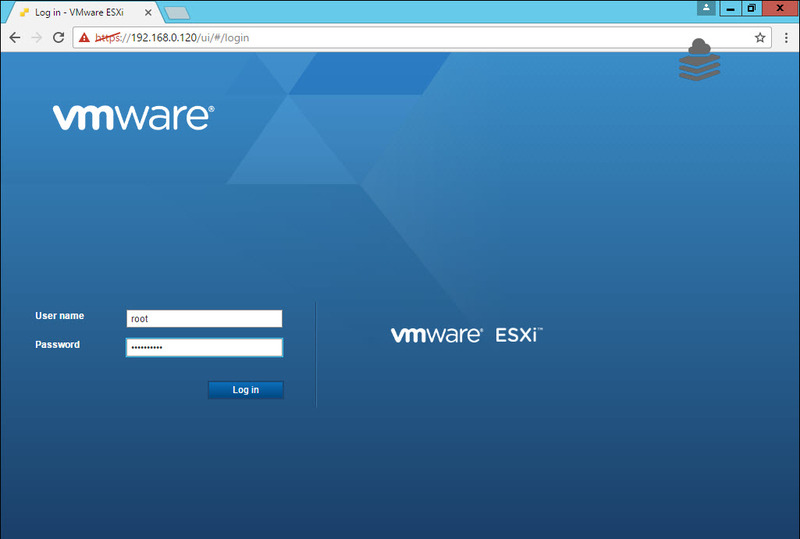 You can see that after entering the IP address of the ESXi you will get the VMware ESXi login screen. Provide the username & password of the ESXi host to login to web client. After successful login you will get the whole new ESXi web client like vCenter Server web client from where you can mange the ESXi host. In the above screenshot you can see the ESXi web client Home page where you can see the details of ESXi & perform tasks on the ESXi host. Here you will get 3 different sections. Navigator will help you to directly navigate to the Host, Virtual machines, Storage & Networking. By using Navigator you can directly access the different Objects. Navigator section includes 4 objects. 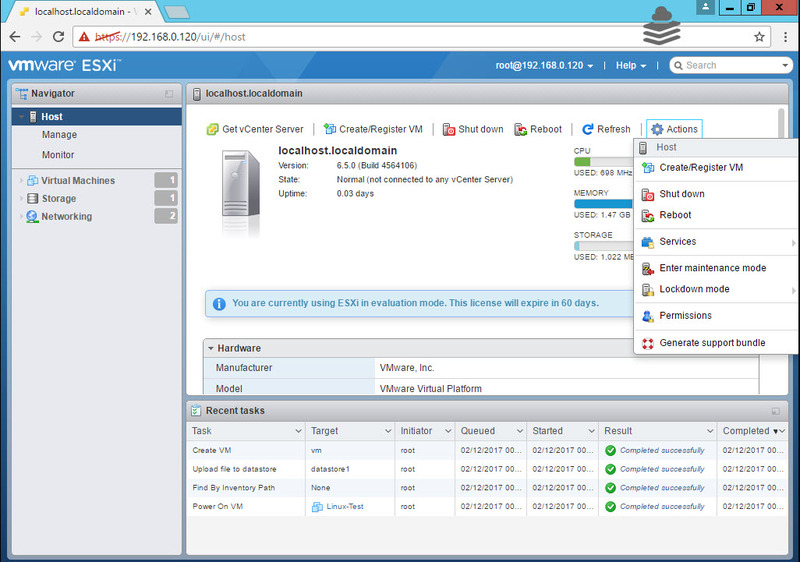 It is the main home screen where you will get all the details of the ESXi host & you can also perform some of the tasks. You will find the Recent tasks section at the bottom like the vCenter Web client. Recent tasks will show all the tasks performed or currently going on in the ESXi host. It will help you to manage & monitor host. 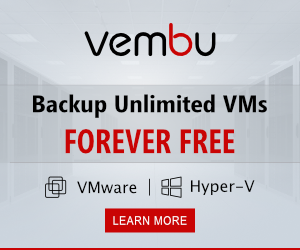 You can Create/Register VM directly from here. You can shutdown or Reboot the Host. You can also perform actions such as Enter host into Maintenance mode, Enable Lockdown Mode, Manage Permissions & Enable/Disable SSH or ESXi shell. Under the Host you will find 2 more options such as Manage & Monitor. You can Manage the ESXi host from here. You will find 6 different tabs under the Manage. System : It will help you to do advanced settings, Autostart configuration , Swap configuration & You can also configure the Time & Date of the ESXi host. Hardware : In the Hardware Tab you will see the Available PCI Devices. 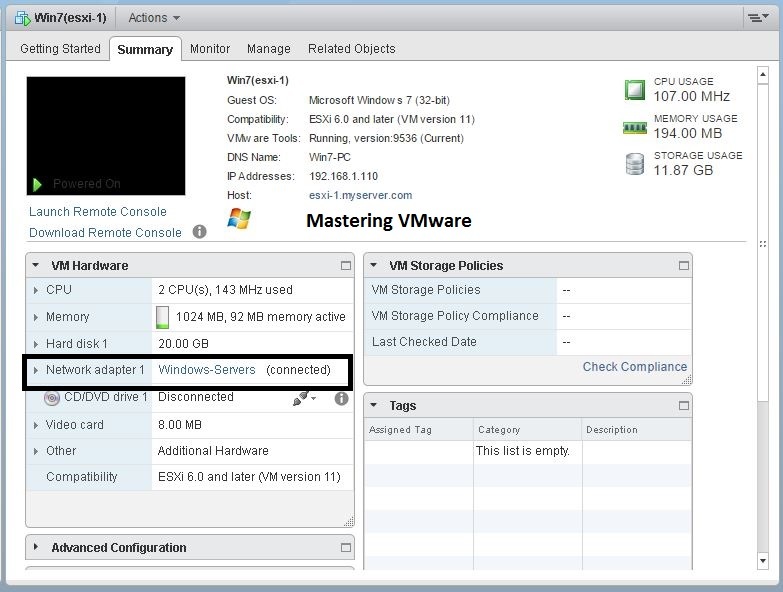 You can view or change the Power Management Policy for the ESXi host. Licensing : In this you will find the License information such as current License & the Licensed features. You can also assign the new license from here. Packages : It will help you to install the Update/Packages in the ESXi host. Services : Here you will find running & stopped services on the ESXi host. You will also start or restart the services from here. Security & Users : It will help you to manage the Security & Users on the ESXi host. It will help you to do following functions on the host. Acceptance Level : Here you can set the Acceptance for the VIBs. Authentication : You can Join the domain for authentication or enable the smart card authentication. 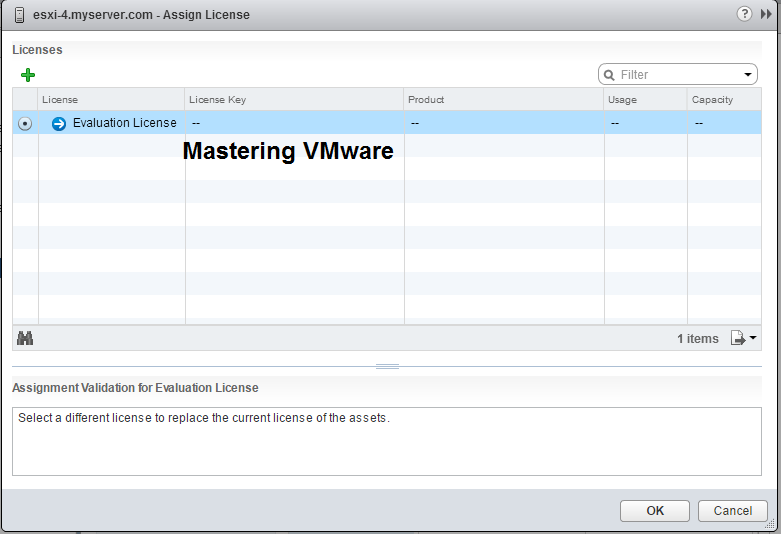 Certificates : You can view & Import new certificates for the ESXi host. Users : You can Add, Edit & Remove the users on the ESXi host. Roles : You can Add, Edit & Remove the roles on the ESXi host. Lockdown Mode : You can view the Lockdown mode information. You can Change the Lockdown mode for the ESXi host. Add or Remove the exception users on the ESXi host. You can do monitoring activities on the host such as viewing cpu,memory performance, viewing logs , checking Tasks & Events. You will find 6 different tabs under the Monitor. 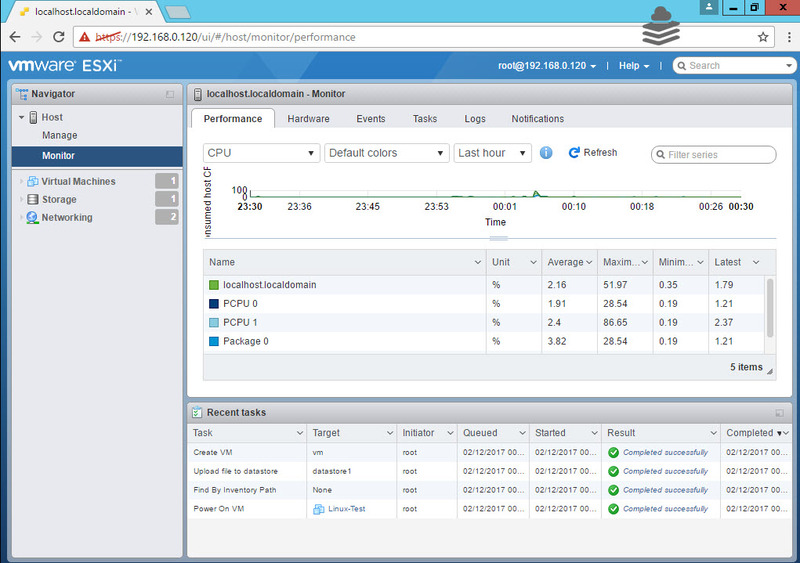 Performance : You can view cpu,memory,network & disk performance of the ESXi host. Hardware : You can view the Hardware sensors of the host from here. Events : View the ESXi Host events. Tasks : View the Running & Completed tasks on the ESXi host. Logs : View the various logs of the ESXi host. You can also Generate Support Bundle from here. Notifications : View the notifications on the ESXi host. 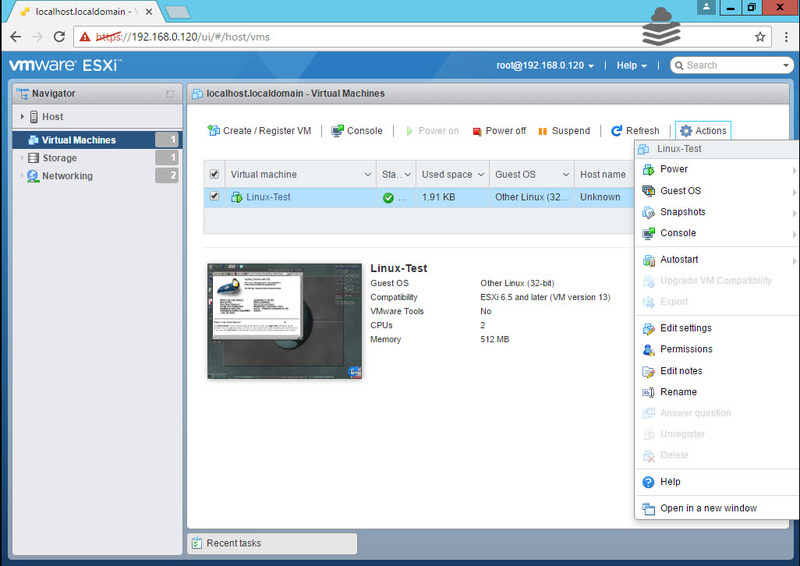 Virtual machines object in the navigator will help to create & manage the virtual machines on the host. you can perform multiple operations on the virtual machine from here such as Create/Register VM, Power on/off or suspend the VM, opening the vm console. You can also do some of the actions on the virtual machine such as Installing VMware Tools, Managing Snapshots, Configuring Autostart, Edit settings of the VM, Set or Manage permissions, Edit Notes, Rename. 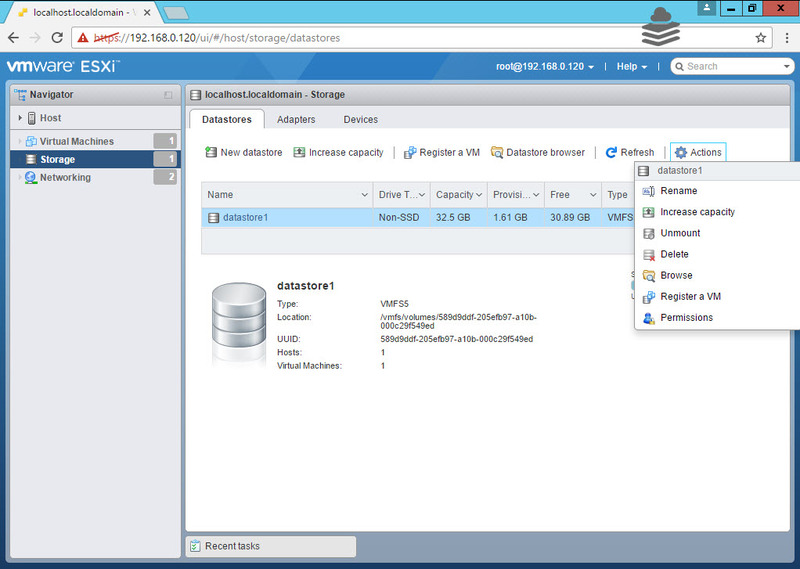 It will help you to view & manage the storage devices of the ESXi host. In Storage object you will find 3 tabs. Datastores , Adapters & Devices. You can view the available datastores, create new datastore, Increase the Capacity of the datastore, Register VM directly from the datastore, Browse the datastore & upload the files. You can also perform some of actions such as Deleting the datastore, Manage Permissions. In this you can view the available storage adapters. You can configure iSCSI adapters & rescan the adapters on the host. You can view & manage the storage devices from here. You can view & manage the host networking from here. In the Networking object you will find 6 tabs Port groups, Virtual Switches, Physical NICs, VMkernal NICs, TCP/IP stacks, Firewall rules. You can view the available port groups on the virtual switch. you can add the port group. you can also manage the settings for the port group such as VLAN ID, Security, NIC Teaming & Traffic Shaping. You can view the virtual switches on the host. you can add/remove virtual switch. you can add the uplink to the existing virtual switch. you can configure settings on the virtual switch such as MTU, Security, NIC Teaming & Traffic shaping. You can view & manage the hosts physical NICs from here. 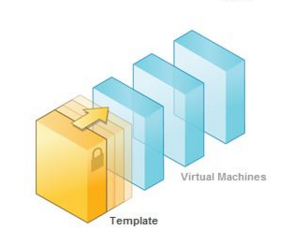 You can view & manage the VMkernel NICs of the virtual switch. you can add the new VMkernel NIC from here. 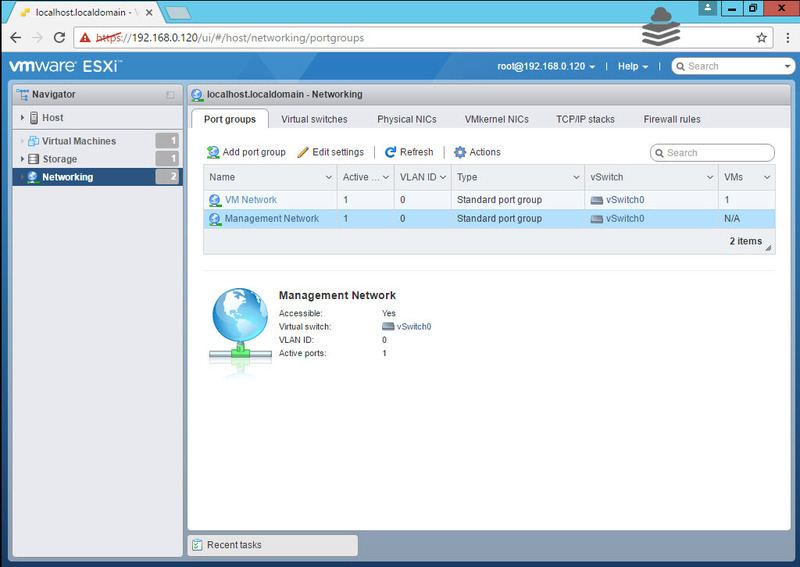 you can configure settings for the VMkernel NIC such as Port group, IP version & services. You can view & manage the TCP/IP stacks. You can also configure settings for the TCP/IP stack such as basic configuration, routing & advanced settings. 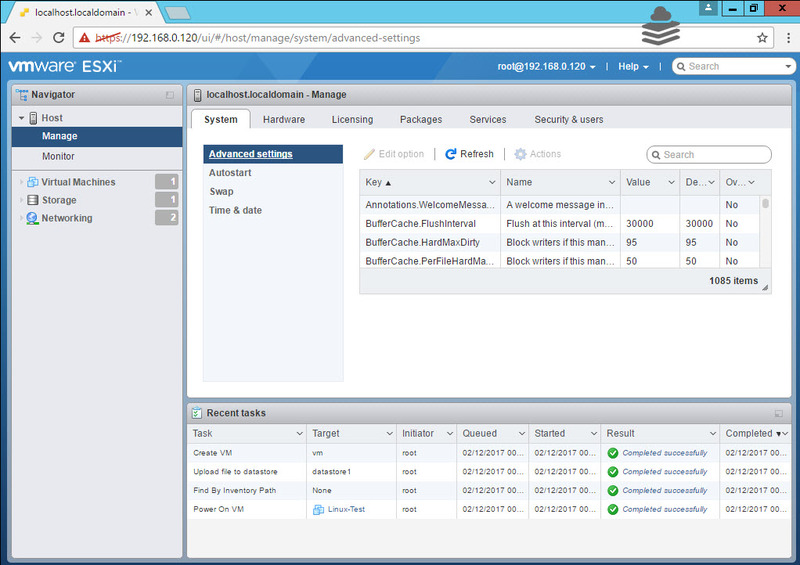 You can view & manage the firewall rules for the ESXi host. You can also configure firewall rules such as allow connections from all IP addresses or allow connections from specific IP addresses. This is the home page where you will get all the details about the objects being selected. You will find the different options here to configure the objects. You can also do various operations on the objects from here. This is basically used for the getting information & performing tasks on the objects. This is the bottom section after home. Here you will find the current or completed tasks on the ESXi hosts. You will find all the tasks details in such as Task name, Target, Initiator, Queued, Start time, complete time & the status of the tasks.